Joseph took his wife and baby and went down to Egypt. OR SOME TIME after Jesus was born, Joseph and Mary stayed with him in Bethlehem. The little baby was not kept long in the stable sleeping in a manger; for after a few days they found room in a house; and there another visit was made to Jesus by strange men from a land far away. "Where is he that is born king of the Jews? In the east we have seen his star, and we have come to worship him." But no one of whom they asked had ever seen this king, or had heard of him. The news of their coming was sent to Herod the king, who was now a very old man. He ruled the land of Judea, as you know, under the emperor at Rome, Augustus Caesar. Herod was a very wicked man, and when he heard of some one born to be a king, he feared that he might lose his own kingdom. He made up his mind to kill this new king. He sent for the priests and scribes, the men who studied and taught the books of the Old Testament, and asked them about this Christ for whom all the people were looking. He said: "Can you tell me where Christ, the king of Israel, is to be born?" They looked at the books of the prophets, and then they said: "He is to be born in Bethlehem of Judea; for thus it is written by the prophet, 'And thou Bethlehem in the land of Judah are not the least among the princes of Judah; for out of thee shall come forth one who shall rule my people Israel.'" "Go to Bethlehem; and there search carefully for the little child; and when you have found him, bring me word again, so that I also may come and worship him." Then the wise men went on their way toward Bethlehem; and suddenly they saw the star again shining upon the road before them. At this they were glad, and followed the star until it led them to the very house where the little child was. They came in, and there they saw the little one, with Mary, its mother. They knew at once that this was the king; and they fell down on their faces and worshipped him as the Lord. Then they brought out gifts of gold and precious perfumes, frankincense and myrrh, which were used in offering sacrifices; and they gave them as presents to the royal child. That night God sent a dream to the wise men, telling them not to go back to Herod, but to go home at once to their own land by another way. They obeyed the Lord, and found another road to their own country without passing through Jerusalem where Herod was living. So Herod could not learn from those men who the child was that was born to be a king. "Rise up quickly; take the little child and his mother, and go down to the land of Egypt, for Herod will try to find the child to kill him." Then at once Joseph rose up in the night, without waiting even for the morning. He took his wife and her baby, and quietly and quickly went with them down to Egypt, which was on the southwest of Judea. There they all stayed in safety, as long as the wicked king Herod lived, which was not many months. King Herod waited for the wise men to come back to him from their visit to Bethlehem; but he soon found that they had gone to their home without bringing to him any word. Then Herod was very angry. He sent out his soldiers to Bethlehem. They came, and by the cruel king's command they seized all the little children in Bethlehem who were three years old, or younger, and killed them all. What a cry went up to God from the mothers in Bethlehem, as their children were torn from their arms and slain! But all this time, the child Jesus whom they were seeking was safe with his mother in the land of Egypt. Soon after this king Herod died, a very old man, cruel to the last. Then the angel of the Lord came again and spoke to Joseph in a dream, saying: "You may now take the young child back to his own land, for the king who sought to kill him is dead." Then Joseph took his wife and the little child Jesus, and started to go again to the land of Judea. 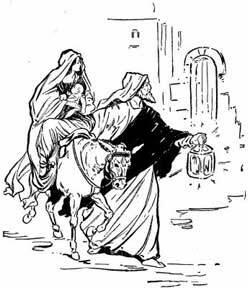 Perhaps it was his thought to go again to Bethlehem, the city of David, and there bring up the child. But he heard that in that part of the land Archelaus, a son of Herod, was now ruling, and who was as wicked and cruel as his father. He feared to go under Archelaus' rule, and instead took his wife and the child to Nazareth, which had been his own home and that of Mary his wife before the child was born. Nazareth was in the part of the land called Galilee, which at that time was ruled by another son of king Herod, a king named Herod Antipas. He was not a good man, but was not so cruel nor bloody as his wicked father had been. So again Joseph the carpenter and Mary his wife were living in Nazareth. And there they stayed for many years while Jesus was growing up. Jesus was not the only child in their house, and he had many other playmates among the boys of Nazareth.